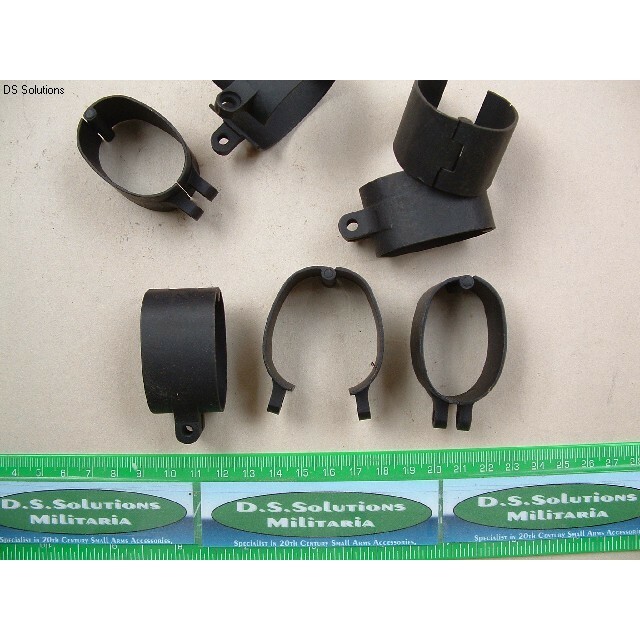 These are original hinged nosecap bands (also refered to as 'Bands, Upper' or 'front bands') for the No4 Rifle. The original SMLE, Rifle No1 MkVI and Trials Pattern No4 Rifles were fitted with hinged nosecap bands. Some Canadian production rifles were also fitted with these bands. Both of these are extremely rare and expensive items. The bands offered here are of the identical pattern, however they carry no markings of any sort and it is believed that these may be of South African origin and probably produced during the 1950's. We are not going to try to pass these off as trials rifle or Canadian bands, but offer these for what they are - although these are uncommon items in their own right. The hinged nosecap band requires a minor modification to the front handguard to accommodate the hinge, in the form of a channel about 3mm deep cut into the wood through the slot in the steel cap which is present on all No4 front handguards. Interestingly this channel does not appear to have been deleted from the drawings for the front handguard and it is not uncommon to find these in new stock handguards produced on and off until spares production ceased probably in the 1970's. 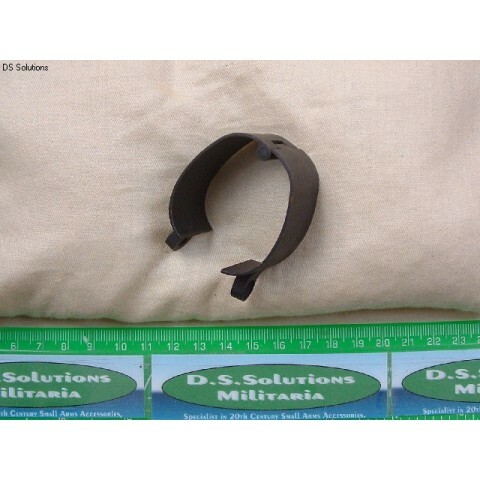 Other than this modification ,which may already be present on the handguard already fitted (you cannot see until the band is removed), these are a direct replacement for the 'production' solid form band. The hinged band makes stripping and assembling the timber a lot easier. The bands are in new and unissued condition with a matt black painted finish. These are occasional small nicks and rubs from being moved around loose in storage. These are of a very minor nature and only mentioned for exactness- see pictures. Unit of sale; 1 Band. Original British Army Part Nos; BB8555 or B1/CR413.